It is Sunday night, and I feel like I have already started a new week. The past handful of days have been tough-ish to say the least. But tonight, after a very long day at work, I had a date with my husband that included a swimming pool, and Chipotle, and that helped more than anything else has this week. On Friday, after discovering that the Kathe Kollwitz exhibit was ending this weekend, my mom convinced me (it didn’t take much) to drop the other plans I had for my time between shifts, and we went to the museum. I am so glad we did. First, there are so many museums around here that going to is a meditative, inspiring, calming experience for me. The Weisman is one of them. (It always brings me back to being in college and going there for class or just to escape between classes. I love seeing how they have remodeled. It is cool to see them have more space to display some of their permanent collection pieces.) Kathe Kollowitz was one of those artists I was inexplicably drawn to and came across frequently in my studies. To have the chance to actually see her work in person is quite amazing. There is a huge difference between seeing a piece of art in person and seeing it in a book. The other completely amazing exhibit that is there now is Tenuous, Though Real and contains artwork from 33 Minnesota artists, including four pieces from my friend and mentor Laura Migliorino, and Gary Hallman, one of my professors from the U, and so many others, some I have met in person, and some I never realized were from Mn. It was amazing! And while I will go to the art museum or an art gallery with anyone who wants to go (and even a few who weren’t really all that willing) it is fun to take my mom – we have some interesting discussions about the pieces. Saturday I had a chance to hang out with Mr. FN. While not all of our plans happened quite like we wanted, he did have time to take me to see his new office space. I must say I am quite impressed with where he works now! He also took me out for a sandwich from Surdyk’s – his favorite lunch spot. We had a little picnic outside and it was quite lovely! Today was quite rough at times. But it ended with Mr. FN and I cooling off in my aunt’s swimming pool and our usual Sunday night Chipotle dinner. It was a small “date”, but it was what we both needed. My granny used to say that when you had a lot of things piling up on your mind, and a lot of things bothering your heart, or any baggage you needed to get rid of, that you should drive past the cemetery and bury it. Let it go. I have often heard her in my head saying that, especially when I know I need to let go of something, or just get over an awful week in general. I have tried it in the past, with a mild amount of success. But what I found tonight works better is drowning it. 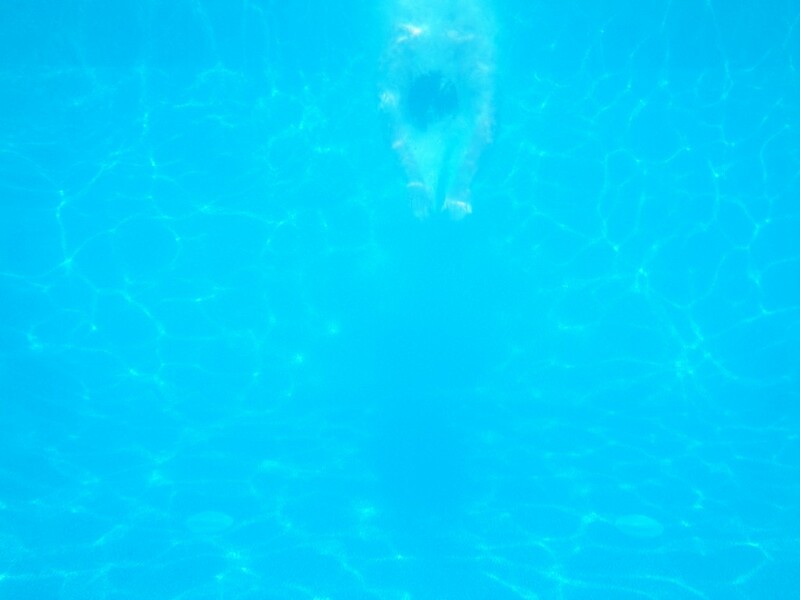 Jumping in a pool, and feeling yourself be weightless again. The water is cool, and for that first bit you can’t concentrate on anything else except breathing. That is where I can get rid of things and just let go. I am so grateful to have had a chance to do that tonight. In an hour a new week will start, though I feel like it already started a couple of hours ago in that pool. John diving in. Taken with a Pentax digital underwater camera, that has since died. I only have underwater film cameras now. This is not a hardship, but something I quite look forward to for this summer.